“Ahh February” is a Two Part Series. See “Ahh February, Part 2” for a few good ideas on keeping your ‘mojo’ going throughout the year, particularly getting through ‘Feb and Winter blahs’. When I was a teenager, I ran full-distance marathons. I come from a running family. My father was our inspiration. He ran more than 70 marathons, and at pretty impressive speeds. He racked up medals and personal best records in marathons throughout Canada and the U.S., – including the famous Boston Marathon. 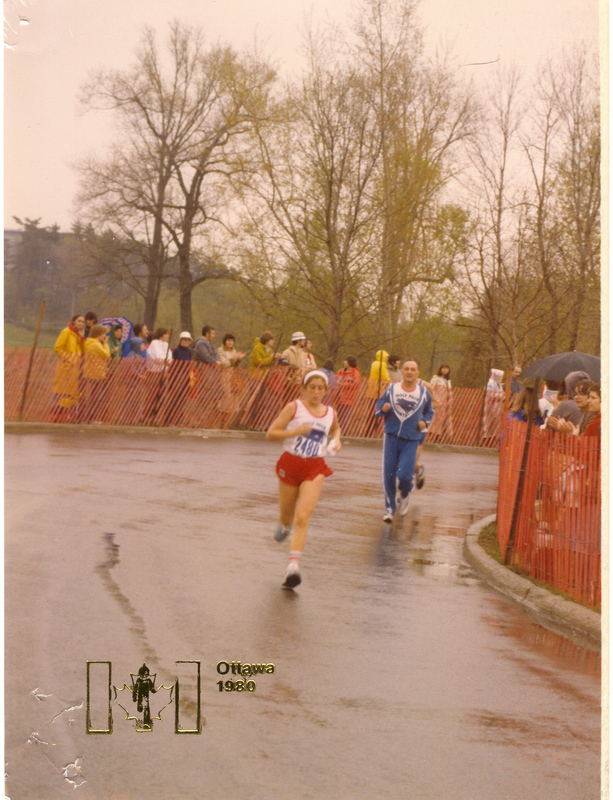 I was 15 when I ran my first marathon in Ottawa. I was much slower than my father but I finished with him. He had already completed the 26.2 miles (42k) with a personal best record of 2 hours and 49 minutes. He showered, changed, and ran back to find me so we could finish the last couple miles together. (Photo: This is me and my Dad — oh so many years ago when I was only 15. It was in the last few steps of my first marathon. My father had finished his in record time; showered and changed and came back to run me in. He stayed a few steps behind me so I could run through the finish line on my own). He trained a lot of people and helped them run their personal best marathons too. Always generous (and still is! ), my father had/has a lot of wisdom to share. One of his lessons had to do with pacing. He was a brilliant pacer – for himself and for others. He said one of the reasons people falter on race day or in their long runs is because start out too fast; or get carried away by the crowds (especially in marathons) and don’t pace themselves along the way. They pay the price by either hitting the wall and quitting the run or dragging themselves through the miles even though they were prepared for a stronger run. In many ways, I think this marathon story offers an important lesson (and metaphor) for how we approach our year (of work and life). Marathons are too long to sprint. And same true for our lives within any given year. We are fresh out of the gate of 2019 – only two months in. Think back to January (now long gone) — that first, fresh mile when we were full of pep, vigour, and aspirations for the year ahead. Many of us have reflected (see my 12 Qs here) and set up some shiny new goals and intentions. Some fresh energy (maybe sprinting) and then – February — ahh, February. The robber of energy, of mojo, and for many, the intentions and goals declared are now either forgotten or sources of guilt. Indeed, February can be tough — those winter, sluggish blues. But this ‘marathon’ (of 2019) is still very young and it’s too soon for the ‘wall’. Like running a good marathon, we need to pace ourselves. We also need a few good habits that will help us ‘run better’ and be more focused and intentional as we make our way through the miles and months ahead. NOTE: See “Ahh February Part 2 – A Few Good Habits“. Perhaps you have a few of those habits of your own? There are many: sleep well; eat healthier; exercise; connect with others. I also think the habit of personal and purposeful reflection is essential. By now, thousands of people have accessed my annual offering of 12 reflection Qs (2018/2019 version of questions to complete the year and start anew). I love that these are helpful in setting up some learning and intentions for the year ahead. But doing this once per year isn’t going to sustain. We need to do this kind of reflection and habits repeatedly throughout the year. What went well? What do you need to learn? What of your superpowers will you use? What’s your intentional theme for (given situation, day, week, month)? And who will your Teachers (and sources of support) be? . And more! Would love to hear what your best habits are for your 2019 ‘marathon’ of work and life (reflection and beyond). I’ve written up a few more myself. Check back soon. I’ll be posting an article soon with some thoughts on a few good habits. And now that we’ve got January ‘done’ and are into the ‘real run’ — I wish you great strides and a strong, steady run. Here’s to early days of your 2019 marathon! Eileen Chadnick (@Chadnick) is a certified coach specializing in career, executive and leadership development and a communications pro (20+ years of experience). Principal of Big Cheese Coaching and Chadnick Communications in Toronto, Eileen draws from the disciplines of positivity, neuroscience, emotional intelligence – and Conversational Intelligence®(C‐IQ®) in her work as a coach, consultant, trusted advisor, and facilitator. In addition to authoring the book, Ease: Manage Overwhelm in Times of Crazy Busy, Eileen is also a contributing leadership and careers columnist with the Globe and Mail.